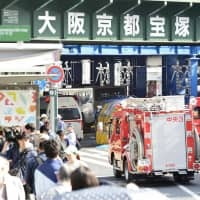 United Nations Secretary-General Antonio Guterres told Prime Minister Shinzo Abe in Tokyo on Wednesday that his visit to Japan this time is of momentous importance for him because he is set to become the first U.N. chief to attend the annual Aug. 9 remembrance ceremony for the victims of the 1945 atomic bombing of Nagasaki. 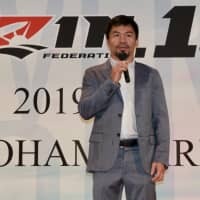 “Since I joined the U.N. many years ago, I have come to Japan at least once a year. But this visit has very special meaning,” he told reporters during a joint news conference with Abe after the two met at the Prime Minister’s Office. “The voice of hibakusha is a fundamental message for peace. ‘No more Nagasaki, never more Hiroshima, not any more hibakusha necessary’ is also a message of the U.N.,” said Guterres, a former Portuguese prime minister who served as U.N. high commissioner for refugees between 2005 and 2015. In 2010, Guterres’s predecessor, Ban Ki-moon, attended the annual Aug. 6 ceremony to commemorate the victims of the atomic bombing of Hiroshima. But this would be the first time a U.N. secretary-general has attend the ceremony in the city of Nagasaki. 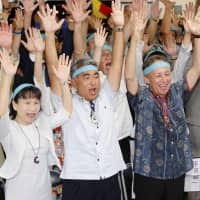 Later Wednesday, Guterres flew to Nagasaki where he is scheduled to separately meet Mayor Tomihisa Taue and survivors of the U.S. atomic bombing, which destroyed much of the city on Aug. 9, 1945. Since Japan is the only country to have been subjected to nuclear attacks during war, the annual ceremonies in Nagasaki and Hiroshima are usually very emotional events for Japanese people and can be politically-sensitive. The atomic bomb dropped on Nagasaki, with its powerful blast, heat and long-lingering radiation, ended up killing about 74,000 people by the end of 1945, according to the city, which had a population of 240,000 prior to the attack. A few seconds after the explosion, the temperature at the hypocenter is estimated to have reached 3,000 degrees to 4,000 degrees Celsius, and 1,800 degrees at a distance of 1 kilometer, according to the Nagasaki Atomic Bomb Museum. On Thursday, Guterres plans to visit the museum and hold a news conference before attending the annual peace memorial ceremony in the city. 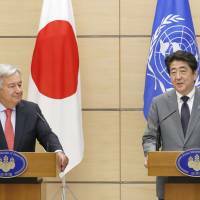 During Wednesday’s news conference in Tokyo, Guterres emphasized that his visit this time is also “important” because it coincides with efforts by the international community to implement U.N. Security Council resolutions that call for the verifiable and irreversible denuclearization of North Korea. 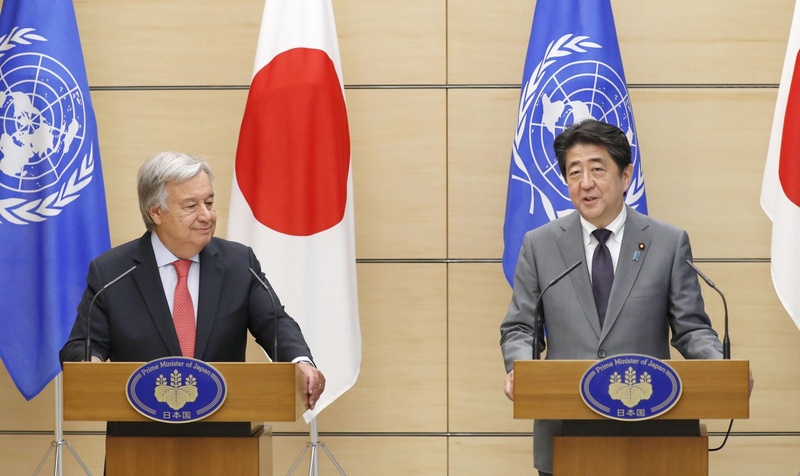 “We also fully support Japanese initiative for dialogue with North Korea,” Guterres said.